Mark Simons, professor of geophysics at Caltech, along with graduate student Brent Minchew, recently logged over 40 hours of flight time mapping the surface of Iceland's glaciers. Flying over two comparatively small ice caps, Hofsjökull and Langjökull, they traveled with NASA pilots and engineers in a retrofitted Gulfstream III business jet, crisscrossing the glaciers numerous times. Using a radar instrument designed at the Jet Propulsion Laboratory (JPL) and mounted on the underbelly of the plane, they imaged the surface of the glaciers, obtaining precise data on the velocity at which these rivers of ice flow downstream. Following a set of test flights in Iceland in 2009, Simons and Minchew went to Iceland in June 2012 to systematically image the two ice caps at the beginning of the summer melt season. 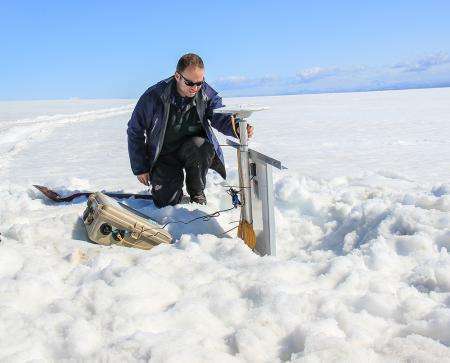 They have just returned from a February 2014 expedition aimed at setting a baseline for glacier velocity—during the winter freeze, meltwater should not play as significant a role in glacier dynamics. They sat down recently to discuss the science and the adventure of monitoring Iceland's glaciers. Why go to Iceland to study glaciers? Mark Simons: Iceland is an ideal natural laboratory. The glaciers there are small enough that you can do detailed measurements of them, and afterward you can process the data and analyze each ice cap in its entirety without needing overwhelming computer resources. This manageable scale lets us explore a wide range of models. Glaciers in Greenland or Antarctica are far too big for that. Logistics are also a lot easier in Iceland. We can drive up to the glaciers in just a few hours from downtown Reykjavik. Most importantly, the Icelanders have a long history of studying these ice caps. In particular, they have nearly complete maps of the ice-bedrock interface. We can complement this information with continuous maps of the daily movement or strain of the glacier surface as well as maps of the topography of the glacier surface. These data are then combined to constrain models of glacier dynamics. How can you map bedrock that is under hundreds of feet of ice? Brent Minchew: Our collaborators at the University of Iceland have been doing this work for decades. Helgi Björnsson and Finnur Pálsson mapped the subglacial bedrock by dragging long radar antennas behind snowmobiles driven over the glaciers. They use long-wavelength radar that penetrates through the ice to the underlying bedrock. By looking at the reflection of the radar signals, they can estimate where the interface is between ice and bedrock. They are expert at studying the cryosphere—the earth's frozen regions, including ice caps, glaciers, and sea ice—as you might expect given their location so far north of the equator. Is this similar to the radar you use in your airplane flights over Iceland's glaciers? Simons: It's a similar principle. Radar is an active imaging system, so unlike optical observations, where you're just looking at the reflected light from the sun, we're actually illuminating the surface like a flashlight, but using radar instead. Was this radar technology developed specifically for imaging glaciers? Minchew: No. The technique we use, InSAR [Interferometric Synthetic Aperture Radar], has been available since the mid-1990s. It has revolutionized a number of disciplines in the earth sciences, including glaciology. The system we are using in Iceland is truly state-of-the-art. It enables complete control over where and when we collect data, and it returns images with millions of independent pixels. It's a very rich data source. Simons: Actually, the exact same airplane we use in Iceland to study glaciers is also used to measure motion above restless volcanoes due to changes in magma pressure or along major seismically active faults such as the San Andreas fault. Repeated radar imaging can show us the parts of the fault that are stuck—those are the places that will generate earthquakes every so often—and the other parts that are steadily creeping year after year. Basically, we're bringing our experience from earthquake physics, both in terms of observation and modeling, to see if it can help us address important problems in glaciology. Are there other methods besides radar for studying glacier dynamics? Minchew: We can drill to the bed and take direct measurements, but a lot of effort is involved in this. Compared to Greenland, where the ice is close to a mile thick, or Antarctica, where it is even thicker, Iceland's glaciers are relatively thin. But they're still on average 300 meters thick. That's a long way to drill down for one data point. Simons: Traditionally people measured velocities of glaciers by putting stakes in the glacier, and then returning to see how far downstream those stakes had moved by the end of the melting season. This approach can give an average velocity over the season. We still utilize this principle by installing GPS units at various spots on the glacier. These GPS units also help us calibrate our radar-based measurements and confirm that our velocity estimates are accurate. What advantages does radar have over these other methods? Simons: One of the wonderful things about radar imaging, unlike optical imaging, is that we can "see" the glacier whether it's day or night, whether it's cloudy or clear. Minchew: Right. Another major advantage of radar technology is that we don't just see the average velocity for the season; we can detect short-term dynamics and variability over the entire glacier if the imaging is done sufficiently often. How exactly does radar work to image the ice cap? Simons: Radar images are usually taken at oblique angles to the surface of the earth, not straight down in a perpendicular line. Given two radar images taken from nearly identical positions but at different times, we can combine them in such a way as to measure changes in ground position that occurred in the intervening period along the oblique direction of the transmitted energy. We quantify these displacements in terms of fractions of a radar wavelength. This process is called repeat pass interferometry. We design the plane's flight path to make several interferometric measurements from different viewing angles, in order that the surface of the glacier is imaged at least three times and often as many as six times. We then combine these different perspectives to create accurate 3-D maps of the surface velocity of the glaciers, detecting its underlying east, north, and up components. How can you be so precise in your measurements from that high up in the air? Simons: The altitude itself isn't a problem. The trick is making certain the plane is at the same absolute position over consecutive flights. We owe this precision to engineers at NASA/JPL; it has nothing to do with us down here at Caltech. They have developed the technology to fly this plane at 40,000 feet, at 450 miles per hour, and then to come back an hour later, a day later, or a year later, and fly that exact same path in coordinates relative to the ground. Essentially they are flying in a "virtual tube" in the air that's less than 10 meters in diameter. That's how accurate it is. Minchew: Of course even within this virtual tube, the plane moves around; that's what aircraft do. But aircraft motion has a characteristic appearance in the data, and it's possible for us to remove this effect. It never ceases to amaze me that we can get centimeter-scale, even millimeter-scale accuracy from an airplane. But we can do it, and it works beautifully. What was the motivation for JPL and NASA to develop this radar technology in the first place? Simons: Part of what NASA has been doing with airborne radar technology is prototyping what they want to do with radar from satellites, and to understand the characteristics of this kind of measurement for different scientific targets. The instrument is called UAVSAR, for Uninhabited Aerial Vehicle Synthetic Aperture Radar. Right now it's clearly not uninhabited because the radar is on a plane with pilots and engineers on board. But the idea is that eventually we could do these radar measurements from a drone that would stay aloft making observations for a day or a day and a half at a stretch. We can also use satellites to make the same type of measurements. Minchew: In ways, satellites are an easier platform for radar measurements. In space, there aren't a whole lot of dramatic perturbations to their motions; they fly a very steady path. But one advantage of an airborne platform is that we can collect data more frequently. We can sample the glacier surface every 24 hours if we wish. Satellites typically sample on the order of once a week to every several weeks. What do you hope to learn from observing glacier dynamics in Iceland? Simons: We want to use measurements of the ice cap to explore what is happening at the bottom of the glacier. We already know from the previous campaign in 2012 that over half of the movement measured in the early summer is associated with sliding at the bed rather than deformation of the ice. In the early part of the melt season, water gets down to the bottom of the glacier and doesn't have anywhere to go, so it increases the pressure at the bottom. It ends up reducing the friction so the glacier can flow faster over the bedrock. At some point there's so much water flow that it starts to make tunnels in the ice, and then the glacier drains more efficiently. But then the tunnels will collapse on themselves, and the whole glacier settles back down, compacting on itself. The glacier actually slides faster in the early part of the melt season than later in the melt season. Minchew: The thing that propels glaciers is simply gravity. Ice is a viscous fluid, like honey. Very cold honey. Once it warms up and begins to melt slightly, the dynamics change tremendously. That's something we can observe in Iceland—unlike in Antarctica—where temperatures regularly go above the freezing point in summer. In Iceland, we think almost all the meltwater at the bed comes from surface melting. Geothermal heating from the earth and frictional heating from the sliding itself can also contribute to melting in Iceland's glaciers. These are the main sources of melting in Antarctica. But geothermal and frictional heating don't have anything to do with climate change nor should they vary with the seasons in the way that meltwater does. Is climate change the major reason why you're studying glaciers? Minchew: No, I just like cold and inhospitable places. Seriously, I was drawn to the field work aspect of geophysics, the opportunity to go to places in the world that are for the most part the way nature intends them to be. I'm also drawn to glaciers because they are fascinating and surprisingly complex physical systems. A number of fundamental problems in glaciology remain unsolved, so there is tremendous potential for discovery in this field. But helping to understand the potential effects of climate change is an obvious application of our work. People are much more interested in glaciers now as a result of climate change. One of the glaciologists at the University of Iceland likes to say, "We've turned a very cold subject into a hot one." Simons: Iceland is actually a very good place to learn about how glaciers will react to climate change. We can watch these glaciers on a seasonal basis and see how they respond to temperature variation rather than trying to compare the behavior of those glaciers in Antarctica that have yet to experience surface melting to what we think their behavior might be 50 years from now. But for me, glaciology has always been interesting in itself. My job is to study the mechanics of the earth and how it deforms. And the cryosphere is just as much a part of that as the crust.